Boba Fett t-shirts for that Fett "Addict"
Message Boards - Boba Fett Fan Club → Collecting → Boba Fett t-shirts for that Fett "Addict"
Topic: Boba Fett t-shirts for that Fett "Addict"
UK Streetwear brand Addict have teamed up with Lucasfilm to produce exclusive boxed tees depicting three of the most iconic characters from the original Star Wars Trilogy! One of which is Boba Fett, of course. Looks like they're already available for pre-order from the Star Wars website, as well. Re: Boba Fett t-shirts for that Fett "Addict"
I'm not sure. You have a picture of it we could see? Is it from the MGM Disney Weekends? Some of those look pretty nice, that they've been selling. We regret to announce that this item will not be available at StarWarsShop. We will therefore cancel this item from your pending order. Additional items that also may be in your order should ship as scheduled. We apologize for the numerous delays that you have experienced while waiting patiently for this item to come into stock. Please let us know if we can be of further assistance. Needless to say I am very, very disappointed. I thought this one would be really nice, considering the last two t-shirts they've put out were kind of crappy. Once agan, let down from Star Wars Shop. They did the same thing for that ART FX watch they had for sale a year or so ago. You'd think they'd have the contract and everything set in stone before offering it on their website for sale. I personally think you shouldn't sell it, if you don't have it in your stockroom, but that's just me. You're not winning in friends today Star Wars Shop. cool shirts, almost reminds me of my old Boba shirt which unfortunately doesn't fit anymore. I'm VERY interested in this, but SWS bailed out of selling them, and they were sold out direct before I'd even heard of them. Didn't know they were selling them direct. Do you know which store or website was selling them? Yeah, the addict site. No Boba, but it looks like they have some Sandtrooper shirts left. Well this isn't off of Addict but I recently made a trip to Hot Topic and purchased my own Tee. Couldn't find it on the website so I took my own pic. Very nice. Is this new at Hot Topic? I'm definitely going there tomorrow. 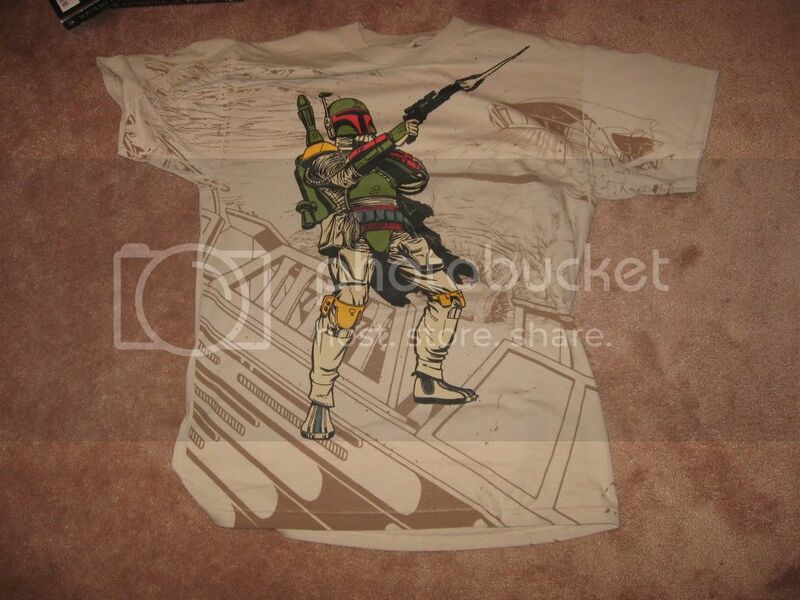 Thats better than the other Fett tee i got there. Not exactly sure how new but it wasn't on their website. Very cool find. I don't even know if they have a Hot Topic over here, but I'm going to have to find one tomorrow. Finally meandered my way over to Hot Topic today and picked one of these shirts up. Very, very nice find, indeed, dude. Very nicely done. It's 100% cotton, though, so if you buy one, I recommend buying one a size larger than what you normally wear. I got one of those "Capture by design, Kill by necessity" t-shirts from there, and it shrunk really good. So, I only got to wear it twice. Now, it still fits, but it's kind of tighter than I like it, so it's more of a lounge around the house shirt. Not something I'd like to wear in public, if you know what I mean?